We are thankful to you for your trust in RouletteOnlineAnt.com. You could not have found a better website for gaining access to internet casinos, gambling news and rules. You are requested to read the below mentioned terms and conditions carefully and if you have any discrepancy you should seek independent counseling before accessing any if the gambling websites. The use of the website will be allowed to only those people who accede to the below mentioned terms and conditions. RouletteOnlineAnt.com is just a source of information and the online gambling at any of the website is the sole responsibility of the user himself. The lists of the gambling sites available on RouletteOnlineAnt.com are accessed via a hyperlink and the sphere of its access is around the globe. There are some territories in the world where online gambling is illegal or its legal status is vague. So if you are choosing to gamble through RouletteOnlineAnt.com then you are agreeing with the fact that online gambling is legal in your area or online betting is not illegal in your territory. Likewise if you are living in a region where online winnings are liable to taxation then it is your own responsibility to pay these taxes to the relevant authorities. Online gambling under the age of 18 years is strictly not permitted. 1) RouletteOnlineAnt.com will not be responsible for any loss of money or any other monetary losses wagered by the player at online gambling sites. 2) RouletteOnlineAnt.com will not share the responsibility in case of following events: if the central computer system of the casino fails, if there are any losses, delays, errors or omissions due to the transmission system of the internet, if there is any policy change regarding gambling and transfer of money, if there are any other unfortunate accidents like public riots, civil disturbances, terrorist activities etc. 3) RouletteOnlineAnt.com will not be responsible for any losses or damages caused to the player because of the misuse of any information transmitted online. 4) RouletteOnlineAnt.com will not be responsible for the cancellation of games or membership or any other discrepancy caused by any gambling website to the user, even if the website is accessed through us. 5) RouletteOnlineAnt.com has the right to change any if these terms without any prior notice. It is the responsibility of the user to keep stay updated with the terms and conditions. We cannot guarantee, that the facts about the casinos are accurate. We will try to keep the information up to date, but the accuracy of the information provided cannot be guaranteed unconditionally. We provide links to many casino sites, and these sites change their promotion s, rules and regulations on a regular basis. 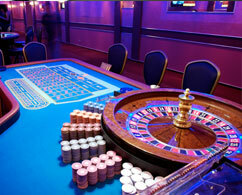 Individual casinos can, and often will, cancel a promotion without prior notice. Always check the rules on the casinos' website before proceeding. It is our utmost effort to provide you with most precise and accurate information regarding online casinos however unconditional guarantee of the accuracy of the information will not be provided as casinos keep on changing their promotions, rules of games, terms and conditions regularly. Hence, it is your responsibility to check the rules before starting a game.